Fences is the story of Troy Maxson, a mid-century Pittsburgh sanitation worker who once dreamed of a baseball career, but was too old when the major leagues began admitting black players. He tries to be a good husband and father, but his lost dream of glory eats at him, and causes him to make a decision that threatens to tear his family apart. Fences is directed by Denzel Washington from a screenplay by August Wilson, adapted from Wilson’s Pulitzer Prize-winning play. This is Washington’s third time in the director’s chair after Antwone Fisher and The Great Debaters. Washington and Viola Davis reprise their roles as Troy and Rose Maxon from the 2010 revival that earned both actors Tony Awards. Fences also stars Jovan Adepo, Stephen McKinley Henderson, Russell Hornsby, Mykelti Williamson and Saniyya Sidney. Washington recently talked about going back to his theatre roots in his latest film. When and how did you first become aware of the work of August Wilson? I saw Ma Rainey’s Black Bottom in 1984, the year it came out, and I remember all the great performances. But Charles Dutton, in particular, just blew me away [in the role of Levee]. I never heard of this guy and then I did research about him and found out he’d been in prison and started acting there and gone to Yale Drama School and all of that. When I saw that play, I didn’t know who August Wilson was. I didn’t know he was going to write all these other great plays, but somehow his voice was a familiar voice to me. I just remember that night in the theatre and just being amazed and moved. What do you recall from when you saw the original Broadway production of Fences? I related more to Cory [played by Courtney B. Vance] because I was closer in age to Cory. And I remember how fragile Mary Alice [as Rose] looked compared to James Earl Jones. I’d seen James do Othello with Christopher Plummer on Broadway. And I’d seen him do Oedipus the King up at St. John the Divine. In fact, I went backstage. He didn’t know me, but I guess he sensed I was a young actor, so he let me hang around. He was meeting people, and I’m walking around looking at his makeup, and he had all of his rings from the play. I started putting them on, and you know James is a big man, so the rings were like bracelets. I just remember how big he was and that voice, that power. What about his performance as Troy? It was James Earl Jones, so you know I’m going to see it. My career started in the theater. I was one of those Lincoln Center Theatre snobs. We weren’t thinking about movies. I was going to be James Earl Jones one day, hopefully, and make $650 a week and do Othello. And, in fact, my first two roles were the Emperor Jones [by Eugene O’Neill] and Othello. So I was thinking about James and Paul Robeson. That was at least the benchmark to shoot for. Did your own father remind you in any ways of Troy? What did your father think of you becoming an actor? I don’t remember what he thought when I started, but I do remember going to visit him in Virginia after I had started to get work. It was embarrassing, because we went to a supermarket or something and he’s telling people there, “You know who this is?” Nobody knew who I was. But I am Denzel Washington, Jr., so he, Denzel Washington, Sr., was bragging about his son. I’m glad for both of us that happened. I remember I was on my way to New York in April ’91, to meet with Spike Lee to work on Malcolm X and my brother was at the airport. And he says, “Come, sit down.” I said, “I don’t need to sit down. Who died?” And it was my father who was on his way to death. And I just remember that connection. How does Troy fit into the life of his family? 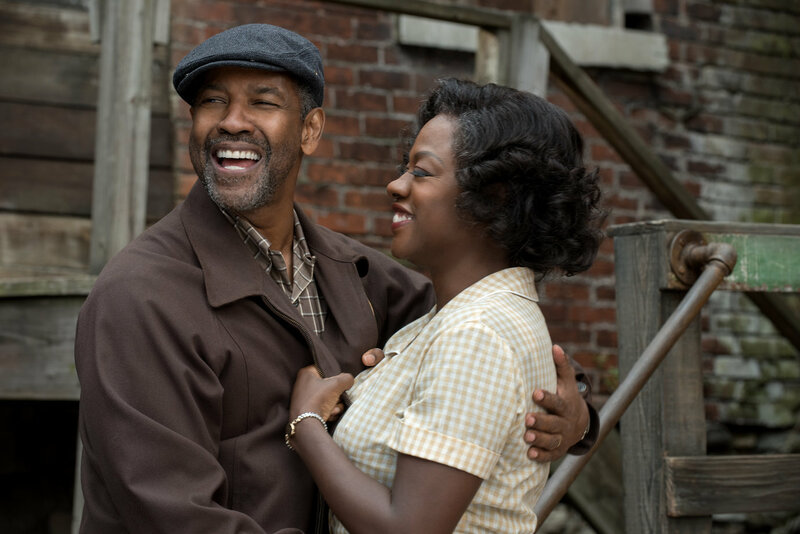 Fences is a story about broken dreams and where does that energy go. It’s about what happens to a dream deferred, as Langston Hughes put it. What happens when you were good enough and you didn’t make it? Where does that energy go when you’re not able to express your talent? Troy could’ve been a Willie Stargell, a great slugger for the Pittsburgh Pirates, but change came too late for Troy. And being fueled with his bitterness, he wants the best for his son, but he could only see so far. Rose is saying, “Hey, Cory can get a chance to go to college with a football scholarship.” And all Troy could see was Cory getting a trade. He doesn’t understand the possibilities. He doesn’t see the future. Like Rose says to him, “The world is changing and you can’t even see it.” Troy’s just stuck in time, ill-equipped to handle a changing world and frustrated about missed opportunity. At what point did you get to know August Wilson himself? I didn’t get to know him too well. I spent a lovely day with him, sometime in the early 2000s. I flew up to Seattle, where he was living then. It rained all day and he just smoked cigarette after cigarette. And he was writing. He was writing Gem of the Ocean [his next-to-last play] and my agent suggested I go up there. So I went up there to see him and we just talked all day. And he talked about how he writes plays, and he locks the doors and shuts the windows and basically writes what the characters tell him to write. So I guess he was telling me, “Look, I’m not just writing something for you, I got to write what I’m compelled to write.” Which was fine with me. And I just remember that day. It was just a lovely day. August Wilson, of course, passed away in 2005. He had completed all the plays in his American Century Cycle. But he did not live to see his screenplay of Fences brought to fruition. Did you have an extra sense of obligation in making the film? Not for me. I had enough already. I didn’t need more motivation. Where did the motivation come from? It came from the material. And it came from August. I was just trying to serve August the best I could. I felt a responsibility to not screw it up. When in doubt, go to the source, you know? If there are 25,000 words in the screenplay, 24,900 of them are August Wilson’s. I may have added a line or an ad-lib here or there, but it’s August’s words. On the one hand, for people in theater and literature, August Wilson is unquestionably among the greatest playwrights in world history. And yet, a lot of people will have this film as their introduction to Wilson’s entire body of work. What do you hope they’ll take away from it? When people ask me what I expect people to take away, I always say that it depends on what they bring to it. I know they’ll be entertained and enlightened. I know that they’ll see great performances, some great actors up there on screen. And they’ll hear a voice that they haven’t heard before, yet is familiar. The rhythm, the music of it. For you as an actor, what was the difference between playing Troy on stage and on screen? I couldn’t imagine trying to do this film, having not done it on stage first to figure out who Troy is. There was no time to be trying to figure that out when we’re shooting a movie. So, number one, I had time to know the character. And I knew that we did a production that worked, that we got the response from the audience and the accolades and all that kind of stuff. I knew it worked. I don’t know if that’s more pressure. It’s like, “Don’t screw it up now.” But all I knew is that I just had to get the camera in front of the actors and let them do what they’d been doing all along. Were there things you were able to use from the stage production? When I steal, I steal from the best. I mean, the shape of the film was fundamentally the shape that we had found or at least the characters that we had found doing the play with [director] Kenny Leon. Now we could take it inside the Maxsons’ house. It’s not all in the backyard, the way it was on stage. We go to different places. But other than obviously Jovan Adepo [as Cory] and Saniyya Sidney [as Raynell], the little girl, nobody else had to catch up. What makes the cast click? Unselfishness. There’s no magic. With the Broadway revival, we had 100-plus opportunities to practice with a sold-out audience every night. So you could find out what works, what doesn’t work. Sometimes we had matinees with 1,200 high school kids who were talking back, and once I remember having to stop. I just stopped in the middle of the play and just stood there and looked at the audience. And they giggled and then they started shushing each other and then they got quiet. And I was like, okay, and I picked up. So we had to deal with everything. For your cast members, what were the challenges of doing the same roles in live theater and then on film? I told the actors, “Don’t worry about that. Don’t change.” There’s no such thing as movie acting, in my opinion. Don’t say, “I’ll have to be small.” Well, then that’s what you’ll appear to be, unless it’s right for your character to be small. Just let me as the director worry about that, and we’ll move the camera. When you’re big, we’ll back up if we have to. What do you think distinguishes Viola most as an actor? The word that just came to my head was “power.” She’s a powerful actor. That’s just the word that comes to my mind, power. She must make you want to be at the top of your form. Well, you want to be at the top of your form anyway. And you better be at the top of your form because it’s August Wilson. And after that, as a director, I want everybody to be great, everybody from Saniyya to Viola. You shot in the Hill District of Pittsburgh, where August Wilson grew up and nine of his plays, including Fences, are set. Was that the plan from the outset? Once I got there and saw it. I didn’t know what the Hill was until I got there and started seeing and meeting the people. I wanted to be in Pittsburgh, no question, on the Hill. The neighborhood, though, has changed a lot since the 1950s, when most of the film is set. Entire blocks of homes are gone. Businesses have shut down. What were the challenges getting the Hill in 2016 to resemble the Hill in 1957? The area where August lived, the lower Hill, was gone. We went further up and we found some streets that were intact. Just take the bars off the windows and change the cars. That must have been great for the people who lived there to see you filming. The neighborhood was a part of making the film; the energy, everybody’s love for August. Mr. Greenlee, who lived behind the house we used for Troy and Rose’s house, became a part of the movie. He’d always come out, ask. “Hey, what are you doing?” “We’re shooting Mr. Greenlee.” “All right. Want some coffee?” That’s all he’d ask, do we want coffee. People would make food for us . You even got to know the pit bull that just wanted you to pet him so he could bite you. So it was a real neighborhood feeling. This is a showcase for Pittsburgh. This is their home and he’s their hero, their playwright, so just to embrace that and to celebrate that. You shot this film sequentially, which is relatively rare in motion pictures. Why was that important to you? I’m an actor first and I know how important that is. I know how I felt as an actor. You get there on Day One and we’re going to shoot the end first. Well, you don’t even know how your character got there yet. So we did try to shoot in sequence whenever possible. Did it present any obstacles? None that stopped me. I mean, weather, rain, whatever, you just keep shooting. During the shoot, you had to be three things: actor, director, producer. How’d you keep your focus and intensity in being able to play these roles? This is what I do. It wasn’t like, “Oh, man, this is going to be extra.” And, not to say it was easier, but it was an advantage having done the play. It wasn’t like I was learning lines at night. I had to re-learn them sometimes, but when you’re in the middle of it, you’re not thinking about it. You’re just doing. Two hours of sleep, three if I was lucky, get up and hit it. What were the things most important to you as a director? The truth. The truth. The truth. Honesty, period. The camera’s going to catch you. All it’s going to do is record what you’re doing. So if you’re lying and you’re not who you’re supposed to be, then it’s going to catch you doing that. And the universal stems from the specific. So everything has to be right, down to the last button. If it says 2:30 on the clock on the wall, then it should say 2:30 on your watch, whether we see it or not. Viola Davis has talked about how the wig she wore for Rose—the strands of gray hair—were key to her inhabiting the role. Is there anything in the costume or props that were touchstones for you as Troy? Probably my pint of gin, you know. His Friday night pint. It’s part of Troy and Bono’s ritual. Everybody knows where they’re going to be. Troy’s going to tell the same lies. Rose is going to say he’s lying. He’s not going to listen. It’s a hard life, but it’s a good life. Everybody’s leading a hard life. Some of the shots in the street, you see the smoke stacks and you feel that factory back there. It’s a hard life, but there’s a lot of joy. Troy’s the one who upsets the cart, with this other woman. Troy, Rose, Bono—they bring joy to their lives. Troy’s the one who screws that up. In terms of my costume, I didn’t have to worry about it. Sharen Davis is a great, great costume designer, and I’ve worked with her a lot over the years. She gets it. She has great taste and she knows how to deliver so I just trusted her. Let’s talk about the music. What decisions did you and Marcelo Zarvos, the composer, make about what role the music would have? Well, the words are the music. And Troy doesn’t stop talking from the start of the movie for 46 minutes almost. So there are no cues, until 40-some minutes in and he tries to bring his brother Gabriel in the house. Troy never shuts up, so we know how he feels. We don’t need violins to tell us. What I said to Marcelo is that less is more, in every aspect. It’s like a home. If each room is overdone, it’s too much. The rooms need to be complementary to make a beautiful home, not each one too loud, too strong. Not to say that’s what Marcelo was doing, but I have to shape all of those different elements into a film— music, dialogue, sound effects. You made a decision to have a score that wasn’t in a jazz or blues style, even though August Wilson often refers to that kind of music in his plays. Why didn’t jazz or blues work for the score? For one thing, Troy says he doesn’t like jazz. His older son, Lyons, is a jazz trumpeter, but Troy says he doesn’t like all that “Chinese music.” And it’s not a movie about jazz. The music has to support the words. You can’t do a four-page monologue and bring in the whole orchestra the whole time. It’s just too many elements for my taste. There are several gospel, jazz and R&B songs that either a character sings or we hear as background in a scene. Why did you choose some of the specific songs? We had a great music editor, Jay Richardson, and I said, “Go, do your research, ’57, spring of ’58, go for it. Let’s see what we got.” So he was bringing a bunch of stuff and, you know, a movie will always tell you what it doesn’t want. You could try to force something in there, but it’ll tell you. And I’ve got a good sense of that, usually. It’s very different, because you know what the words are. I did what I call a performance pass to try to let the editor assemble the film, put his version of it together. I looked at that and then I started looking at the performances. It was a slow process, because we know where we’re beginning, and it’s not like we’re rewriting the third act. We know what it is. The question became, who would the camera be on? When people have these speeches, you just can’t stay with the person doing all the talking. So the question becomes, when would you cut to the other person? I remember talking to my wife about it and she said, “It’s different, I don’t get to watch everybody all at the same time.” I said, “It’s a movie now.” In a play, they’re sitting up there in a box and you can decide who you want to look at. You can look at somebody who’s never talking. But now, in a film, you just can’t sit outside and hold this wide shot. Now everybody’ll be in profile. So you got to make decisions. And that was a slow process. Why are we on Cory and not on his mom, even though she has the monologue? When is it important for us as the audience to know that he’s listening? Or for us to see what effect it has on him? Things like that. Viola said that you gave her some great tips on her big final scene with Cory. She’s chastising him for saying he won’t attend Troy’s funeral, and she’s also really taking stock of Troy’s life, his pros and cons as a man. Viola remembers you telling her, the speech isn’t for Rose, it’s for Cory. There’s really no such thing as a monologue. You’re always talking to someone. That speech, it’s for him. And so if you don’t convince him, that’s something active to give an actor. “Do you think he believes you? When you’re directing an actor, you try to ask the right question. Because you don’t want to crush an actor. I’ve been on the other side of it, where a director says, “I think he would do this.” And I’m like, “Then why don’t you get up there and do it, because that’s what you think.” There are all kinds of truths. Just because I’m the director doesn’t mean I know the truth. I’m there to discover like everyone else, whatever they say. Eighty percent of it is casting. Get the best and let them do what they do and let’s see what happens. You mentioned that you had a daily ritual of asking August Wilson — meaning, of course, the spirit or soul of August Wilson — what he thought of what you were doing. It wasn’t just a ritual. If I didn’t have an answer to some problem or challenge or choice, sometimes I’d go, “Maybe that’s not what August wants.” That was throughout the process. Why didn’t he put this in there? Well, maybe he didn’t want it. Well, I wonder why. What would happen if you did? You know, sometimes you fiddle around with ideas like that until you realize, okay, that’s not a good idea. But you need to wake it up. You need to keep asking. I was just aware of not wanting to rely on our past success. We were very successful as a play and that’s great. Now we’re starting over or at least like to look at it that way. We’re starting fresh. There was a particularly poignant moment that happened as you were shooting the last scene. What was your thought about that final shot with the heavens opening? In the stage directions, August writes that heaven should open up as wide as God’s closet. So how do you do that without it being too much? How quickly do we get off of the shot? What did we see? It’s not so much, you know. But you don’t actually see the shark that much in Jaws. We don’t want to see too much, we want to see how Rose and Cory and the rest feel. As for what we think we saw, something’s left to our imagination. What do you think about August’s relationship with religion? I like to use the word “spirituality” because “religion,” that’s when man gets in it. Oh, mine is right and yours isn’t, you know? August obviously has this spiritual essence, as do I. I try to make that a part of everything I do. I start my day with a prayer. I’m not telling you what you’re supposed to believe or I don’t even like that word religion. Because that’s, that’s a man-made thing, it smells like man to me. Fences is set in a very precise time — 1957, with a final scene in 1965. Do you find yourself thinking of how it can speak to the present day? You spoke before about how the universal stems from the specific. In what way does this film hit universal chords? That’s what you do. You do what you do and then you see how it affected you or the feeling you got. I’m not trying to tell people what they should feel but, you know, August Wilson wrote a masterpiece, and God only knows how it affects people. And that’s the beauty of it. Come in, sit down, and we’ll find out or you’ll find out. I’m happy now that Fences goes to the masses. I was reading about how much it is taught in schools. So a lot of young kids may know more about it than our generation might. So to be a part of spreading the words of August Wilson is an honor and I take it seriously and I know it’s a responsibility. It’s part of our job, my job to, to share him with more people. So they’ll find out why he’s with the greatest ones. You’ve got Tennessee Williams, Arthur Miller, Eugene O’Neill, Edward Albee, August Wilson. I’m happy to do my part and to help share his brilliance with the world. You worked with an exceptional cast. We’ve already discussed Viola Davis as Rose. What can you tell us about the other cast members? Jovan Adepo is Cory. I remember him coming in, and I really wanted to push around the young actors auditioning for Cory to see if they could handle it. Because Jovan and, and Saniyya Sidney as Raynell, they had to catch up with the rest of us. Especially Jovan, because his part is so large. And he was just head and shoulders above the rest of the actors I auditioned. He just had a naturalness and an honesty to him. Jovan was actually up for a role with Antoine Fuqua in a series about Training Day [directed by Fuqua]. So I asked Antoine about this kid and he said, “Oh, yeah, he’s, he’s the best actor by far.” I said, “Well, why aren’t you hiring him?” He said, “He’s not edgy. I wanted someone a little more edgy for our show, but he was the best actor that we read.” So that, needless to say, gave Jovan a leg up on everybody else. What about Stephen McKinley Henderson, who plays Bono? Stephen goes back, as far back as August. I think he’s done all the plays [in the American Century Cycle] and he’s just a veteran in the theatre. It’s a great story for me with Stephen and with Mykelti Williamson, in that they’ve been around a long time, had careers with different directors. They’re veterans, and for each of them, the actor has now met the role. They’re being reintroduced, or introduced, to a whole new generation. What impressed you about Stephen’s performance? What about Russell Hornsby as Lyons? I remember we were shooting a scene outside with Rose and Cory, and I had an instinct. I said, “Let’s get Lyons in here and put him in the kitchen, and shoot him listening.” Here is a man, a grown man, learning about his father from the woman who’s not his mother, telling his half-brother, neither of them knowing that Lyons is listening. Once we set that camera up and I looked at the shot, I said, “Wow, this is something you don’t get to do in the play, unless he was up in the window somewhere, something weird.” But we get to feel him. I liked that moment. And Mykelti, who plays Gabriel? Mykelti, he’s all love. He’s all spirit, a very strong man, but very sweet. He’s had a very fascinating career and life in in this business, and this film is like a homecoming kind of thing for him. I think for a lot of people in the audience, it’ll be like, “Oh, yeah, I remember him.” Yeah, well, he was good then and he’s just as good now. We’ve spoken about the actors. Let’s turn to the crew, starting with your film editor, Hughes Winborne. We worked together on The Great Debaters. This is our second film together. He won the Academy Award® for Crash. Very sensitive, very wise. And he just has a touch. I like watching him cut, because he’ll start waving his hands around and everything. He gets in there and he feels it and he knows when to cut. I don’t want to say it’s natural, but he has a rhythm that works, and that works well for August. We had to find the rhythm. We had to work on the rhythm. With August Wilson, like Shakespeare, sometimes a paragraph means something. And if there are too many gaps, too many breaths, too much air in between, it could grind to a halt. Talk about Charlotte Bruus Christensen, your cinematographer. Charlotte is very gifted. This town is just finding out about her, and now she’s got jobs lined up like planes over Cleveland. Very gifted, very thorough, and very opinionated—which was fine, because we both have strong opinions. But she loves making movies and she comes with tons of ideas and she thinks about things and she writes notes. She’d bring too much which is all you could ask for. This is a film that has a great commitment to production design, to getting the Hill District circa 1957 exactly right. So what can you say about David Gropman, the production designer? How much was the production design informed by the photographs of Teenie Harris? For decades, he captured black Pittsburgh, tens of thousands of images. Yeah, he shot everywhere. And Teenie, he’d take, he’d take just one shot. He said he let all the other photographers work and they’d be running around and he’d find the best place and then he’d get right there. And he was known for popping the bulb out of the flash unit and catching it, catching it in his pocket. And with Fences, we hope we’ve caught Pittsburgh too. Fences is now playing in select theaters and opens nationwide on December 23rd.